Irish golfer Rory McIlroy and UNICEF have announced a major extension of their global partnership as he unveiled his new golf bag featuring the UNICEF logo on the front. In addition to his UNICEF-branded bag, Rory will continue to support UNICEF’s work for children across the world as an Ambassador for UNICEF Ireland. Rory McIlroy will use his new bag competitively for the first time at the 2012 Masters Tournament in Augusta, Georgia. On his decision to place the UNICEF logo on his tour bag, McIlroy continued, "A branding position became available on my bag and I knew right away that UNICEF was the correct fit. I try to help out whenever I can, and I saw this as an opportunity to give UNICEF some added exposure and hopefully increase awareness for such a great cause. The announcement coincides with a worldwide appeal by UNICEF for the children of the Sahel region of Africa. Right now, over one million children, living in eight countries across the Sahel belt are at risk of dying from severe malnutrition. UNICEF urgently needs support to scale up its emergency nutritional programmes in over 200 feeding centres throughout the region to save children’s lives. Donations can be made at www.unicef.ie. Rory was appointed a National Ambassador for UNICEF Ireland in March 2011. 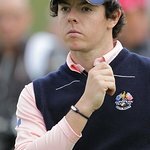 Currently ranked number two in the world, 22-year-old McIlroy became the World Number One golfer on the 4th of March 2012 when he won the PGA Tour’s Honda Classic. This was Rory’s 5th official win since turning professional in September 2007. On the 19th of June 2011, McIlroy secured his first Major title by winning the U.S. Open at Congressional Country Club. He was also a member of the victorious 2010 European Ryder Cup Team.